Most of us try to reduce our carbon footprint by recycling, flipping off the lights when we leave a room, and weatherproofing our homes. And while those are all important efforts, we sometimes forget that the biggest environmental impact we can make happens at the cash register. As we strive to leave a better planet for our kids and grandkids, it's time to take a new look at how our everyday consumer habits affect the health of our natural environment. 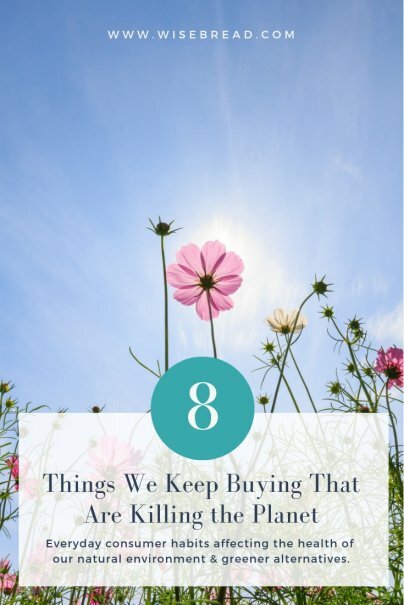 Here are eight things we keep buying that are killing the planet — along with some greener (and less expensive) alternatives. According to statistics from Ban the Bottle, an environmental organization that advocates for an organized phase-out of the single-use plastic water bottle, Americans toss out 50 billion plastic water bottles every year. Besides the bottles themselves, the plastic netting or wrapping that holds cases of bottles together takes a huge toll on the environment. That quick cup of coffee we buy on the way to work is composed of three parts: A paper (or worse — polystyrene) body, a cardboard sleeve, and a plastic lid. One cup every workday means that each of us is contributing 240 cups (or 720 individual pieces of waste) to the landfill every year. The solution? Learn to brew a better cup of coffee at home or buy a cheap reusable travel mug and tote it to the coffee shop with you every morning. Besides helping the planet, many coffee vendors offer modest discounts if you BYOM (Bring Your Own Mug). From carry-out restaurant orders, to family barbeques, disposable flatware is everywhere. And every single plastic knife, fork, spoon, and spork we use takes about 1,000 years to disintegrate. That's a big environmental impact for a couple bites of potato salad. Instead of plastic, collect mismatched pieces of stainless steel flatware at garage sales or thrift stores. If you lose a piece, it won't be the end of the world. And most importantly, keep them handy in your purse, computer bag, or a special container in the car. It's hard to argue that disposable plates have their place — say a company cookout or similar event where plumbing isn't readily accessible. But I've noticed a curious shift with some of my acquaintances and coworkers — they're using disposable plates on a daily basis at home simply to make cleanup easier. The old debate about the environmental effects of using paper plates versus the soap, water, and electricity used to clean traditional ceramic dinnerware has been settled. In environmental terms, paper loses. The resources used to manufacture, wrap, ship, and recycle a neverending stream of single-use paper plates make them an ecological burden. Whenever possible, use what's reusable. I know they're dirt-grabbing wonders, but those single-use cloths for dusting and floor cleaning are usually made from synthetic material that takes generations to biodegrade. Skip the expense and invest in a microfiber cloth that can be washed and reused. Because of their design (inexpensive metal mixed with plastic) recycling disposable razors is a challenge. As a result, a whopping two billion end up in U.S. landfills each year. If you shave every day, consider buying an electric shaver or a razor that only requires refillable cartridges. Feeling brave? Go old-school and invest in a straight razor. According to facts compiled by the U.S. International Trade Commission, Americans go through an estimated 100 billion plastic shopping bags every year, and only 6% are recycled after use. The rest take 1,000 years to fully biodegrade in landfills. While consumers don't technically buy these bags, we can help make them obsolete by choosing (and diligently using!) cotton, canvas, or mesh shopping totes. Have a stockpile of plastic grocery bags in your closet or pantry? Explore some clever ways to reuse them. According to the Food and Agriculture Organization of the United Nations, an estimated 60% of the earth's greenhouse gas emissions can be tied to animal agriculture. All politics aside, reducing the need to grow crops solely for animal feed means we can devote more land to food crops destined for direct human consumption (maximizing fuel and water resources and minimizing the threat of continued deforestation). Another bonus? Going (mostly) meatless saves money. Start by experimenting with alternative sources of healthy protein such as beans, nuts, and quinoa. Integrate meatless main dishes into your meals a few times each week. What products have you phased out of your life in an effort to help the environment? Share your ideas with us! Yes!! Your points are well taken. I would add straws to the list, but honesty, I'm not sure I can give up my Swiffer pads. If I try to give up the other items, can I keep these pads? Why was there no mention of disposable diapers? Not PC? ?